The Brony Boy Baseball Cap is a glittery blue baseball cap with “Brony Boy” displayed in pink. The term Brony refers to a male fan of the show “My Little Pony.” Despite the show and franchise seemingly being marketed toward young girls, the show has a large following among teens and adults, men and women alike, who appreciate the show for its loveable characters, unique situations, and vivid art direction. 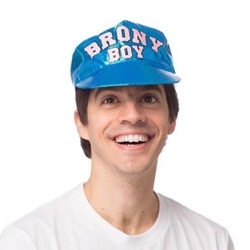 Stand out this Halloween with the Brony Boy Baseball Cap!